Have two potential sites, both with issues. Where would you build? I'm in the process of contacting builders to get quotes, but I'd like to get some opinions/feedback here in the meantime. I had initially wanted a 15x30 vinyl or fiberglass pool, but when I laid it out with marking flags, it felt huge. I know that bigger is better, but it just felt like it took over the yard too much. I ended up marking out a 12x24, which felt like a better fit in the space. It's just my husband and me (no kids), and I'll be the one using it the most, so I feel like that's a good size. As I mentioned, I have two potential site, both with issues and I'm just not sure which would be best. The first would have the pool running parallel to our existing deck (which is about 16x30), with about 4 feet of space between the deck and the pool. This is the flattest part of our yard, but we'd be about 10-12 feet from the trunk of a 14 inch caliper trunk maple, which means we'll be running into roots. The maple is staying, so I'm concerned about damage to the tree and potential damage to the pool, since we're not doing gunite. The second option has the pool running perpendicular to the deck and house. I can set the pool there about 6 feet from the deck and 10 feet from the house. However, there is a significant slope there, our electrical runs from the pole directly over this area, and our a/c unit is right there. Over the past year, when I've visualized having a pool, I keep seeing it in the second spot. 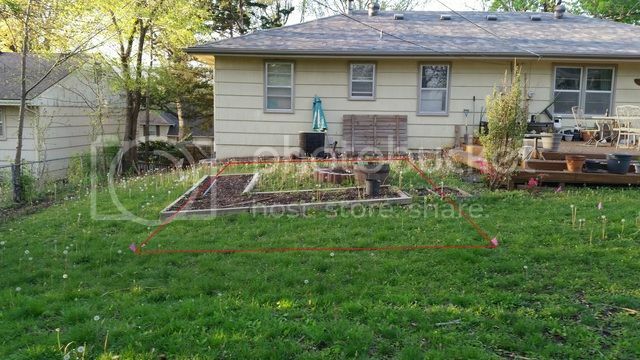 The first spot feels unappealing, because I feel like I'm just stacking rectangles there, because I can't do much on the sloped part of the yard. I do have my garden beds there, but that was because that area got the most sun at the time. 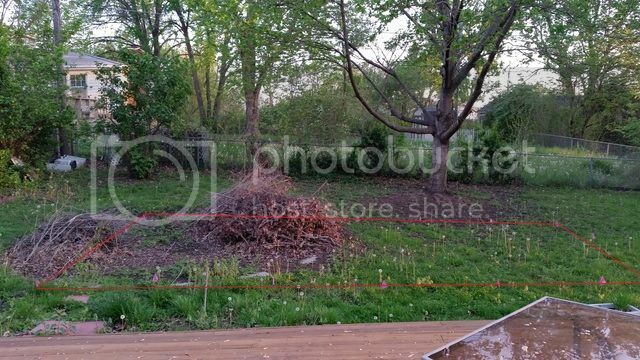 Both spots will get the same amount of sun and both will have debris from the maple. Which spot would you put a pool? You know what??????? Share some pics with us. That is how I work best. I am very visual. See if you can mark where each pool would go. The electric company and/or city won't let you put a pool under a power line. You will either have to reroute the line or bury it, neither is cheap. Slopes cause extra money to be spent and no electrical lines can be overhead so moving that will be spendy. That said, slopes can also lead to nice layouts with walls or sloped surfaces - of which we have both (and again lead to more $$). I wouldn't put a vinyl or FG pool that close to a mature tree that is prone to shallow roots. Ok, I'm back with some rather terrible pics. Please forgive the disaster that is my yard. I'm at the start of my busy season at work and that combined with rain on any day off I've managed to have means weeds galore. This is the first site, as I'm standing on the deck. That's a 12x24 and is 4 ft out from the deck. You can see the tree in the back. Here is another angle and I'm standing probably 6 ft away. And one more from the fence line you see, just to give you a better feel for the size of the yard. Here's the other site. Those are the overhead lines which run over the site, although only one of them is electrical. The other two are cable lines, which we'd actually like to have removed. Another angle, to give you a feel for the slope. I am standing at the fence line and the camera is chest high. 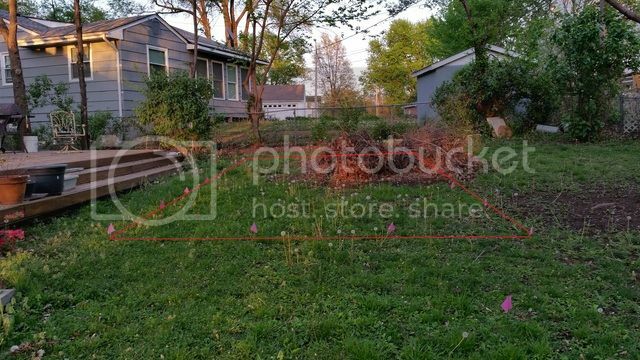 From what I've read about code in our area, there is apparently an electrical easement (or something similar) running 10 feet around the perimeter of the yard and we can't build in that area, which I've accounted for with both potential sites. The first is (I think) 12 feet out and the second is around 15 feet out. I know you can't have electrical lines running over a pool, but I've never liked its location anyway, but didn't realize you could have it moved until I started researching this. Honestly, a pool is something I'd like to have, but I have no idea if it's really feasible in the space we have. Is removing the tree in fact a non-starter? I can't tell you how many people I've read that get pools and subsequently cut down trees they thought they couldn't live without (or bite the bullet beforehand). Myself included and I love trees. Others may disagree on the large tree and it's proximity to your first building location so they will be good to hear from. Good job on the pictures and working on getting all the applicable regulations in hand. I would pick site 1. You could bring the decking of the pool up to your wooden deck and have a really nice sized outdoor space. As others suggested, I would highly recommend removing the tree. If not, I would cut all branches off from the ground up to about 12' or 14'. I'd rather not remove the tree, although it was so much prettier last year. A tree service was removing some tree in our neighbors yard (along the fence line) and we had been talking about having that tree trimmed. I was very clear about what I wanted, but the service ended up butchering it. I don't mind having to fish tree debris out of the pool. Our above ground pool was located where all that brush is and the tree branches extended over the pool about 3 feet and we didn't have much of an issue. It all might be a moot point anyway, as one pool company emailed me and said their vinyl pools start at $35k. I didn't give them any information beyond the size I was looking at, so if that's the starting price for a vinyl pool here, then a pool will more than I'm willing to pay. Gotcha. If that ends up being the case there are several other options like a Dough Boy partially buried. Cheaper I'm sure. The company I mentioned above was the only one to contact me, out of the 4 or 5 I initially contacted, so I cast a wider next last week and contacted every company in the area that said they did vinyl or fiberglass. Three of those companies have contacted me and it seems that vinyl starts around 25k and averages about 40k and fiberglass starts at around 40k. One company gave a general breakdown of that their price included, which was very helpful. In any case, I'm thinking going with a pool company is going to be more than what I want to spend, which is fine, since I'm still in the information gathering stage. I have been looking into semi inground pools, which I think could be a good option, as well as maybe doing an owner build. As far as semi inground, I've been looking at Doughboys and the Aquasport 52, but I'm having trouble finding information from actual owners (rather than companies) and the threads about something like that here seem to be few and far between or outdated/not updated. I'd love to know how they've held up after a couple of years of use. With the owner build option, I'm hesitant because I feel like I might be simplifying the process in my head (ignore the fact I'm not talking about plumbing for the moment). To me, it seems that you dig the hole (bigger than what the pool is), install the sides, level the floor with concrete or vermiculite, backfill with 'something' (I can't tell if what videos I've watch are using AB3/crusher run or clean gravel) then soil, install liner, fill pool, do paver surround. It feel simple in my head, but it can't be that easy? I'm going to go back and search for owner build threads here. I've read them, but I think it's time to take a second look. You will find once you find one good one of any of these they can lead you to good ones of the others. We do have one build where they are doing ALL of the work on their own! LOTS of hard work and time. They are doing it when they can, as they can. Sorry to hijack, but which OB is being done completely by the owner? I'd like to check it out. After talking to a friend, I might know a hole digger. (I actually know tons of hole diggers, but they don't have the equipment, I don't think). My husband probably knows plumbing and electrical people that might cut us a deal, we can put the pool together, so it's just a matter of figuring out the bottom. Without giving too much away, I work for a company that has a ton of heavy equipment operators and I know some of them do work on the side. So I'm kind of toying with the idea of putting together my own crew, in a way. The pros of this would be having people I know and trust to do the work, but he cons would be that it would take longer to do and if things go wrong, I'd have trouble being as "forceful" or direct with them than I would with people I don't know. Though, I know they'd show up and do the work, because they are good people. In other news, I've been looking at Radiant pools and I'm really liking what can apparently been done with them. I had really wanted the "flat to the ground" inground look, but since I think I've got my heart set on doing this where the slope is, I've been looking at pools on slopes and I'm liking what I'm seeing. I'm getting some great ideas from similar pools online and I think it could turn that part of the yard into something pretty cool. That's what I'm thinking, YippeeSkippy! I've already contacted our local dealer to see about the potential. Also, in potential site news, this happened this weekend. I didn't think the storm was that bad. 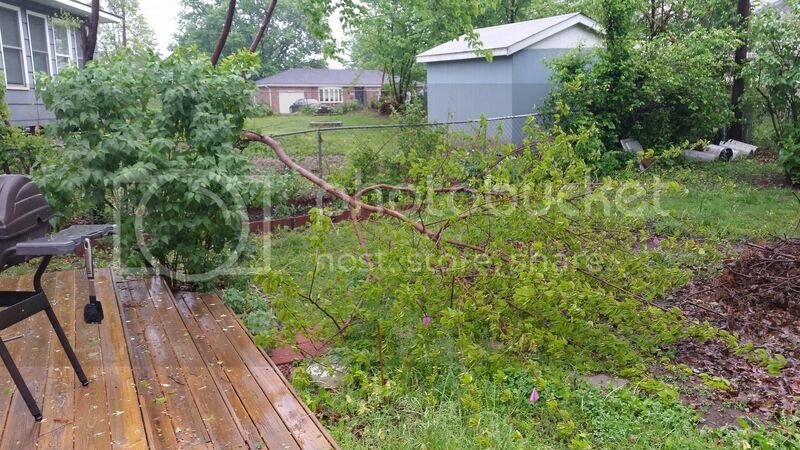 Somehow the fence wasn't damaged. You are heading in the right direction for sure. I would, also, worry about mixing personal (pool dig) with professional (work) if anything went wrong. I guess that is a chance you have to take though. It snapped! Just snapped in half over the fence! That had to be quite a wind there! What's crazy about that tree is that the wind didn't seem that bad. Our power went out, but our power goes out all the time, so I didn't think much of it. I believe that's a mulberry tree, which was a bush when the original owners of the house lived there. 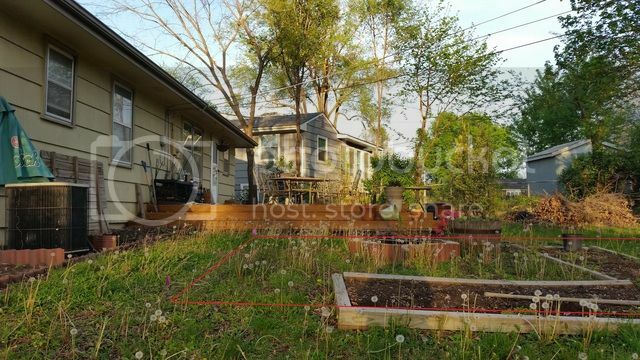 They got foreclosed upon about 5 years ago and the next two owners didn't take care of their backyard, which allowed it to take over. 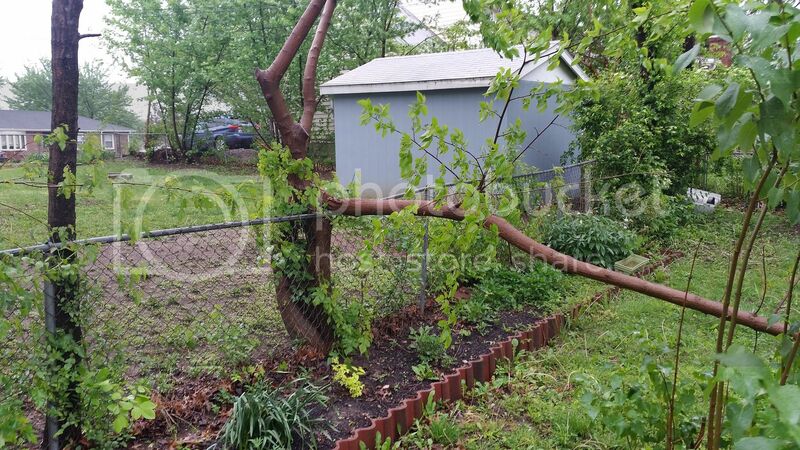 At one point, it extended about 10 feet into our yard and we sheared it off at the fence like, as that neighbor refused to take us up on our offer to trim it properly. When they sold the house, they hired a company to trim the trees and they butchered most of the trees along the fence line. We would actually like to replace the fence, as we have several trees growing into the fence. 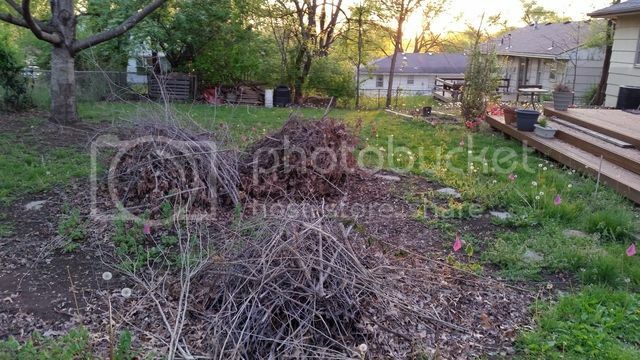 The new neighbors seem to be reasonable people, so I'm hopeful they would be willing to go in on a new fence, while we do the labor on removing the trees. But enough about trees! I received a response from our local Radiant dealer and I'm liking the initial price, though I'm not sure what it includes. I realize that no one will really be able to answer this, but is it unreasonable for me to assume that the price I was given includes installation and equipment? If so, the starting price is reasonable to me. I know they will be additional costs, due to the slope, among other things, but I'm interested enough that I'm planning on stopping by on my day off to check things out. Well, this all may be a moot point, because it suddenly occurred to me to measure our side yard clearance and we only have 6 ft of clearance. We could have 10 feet if we remove a tree, or if they can go at an angle, but this could be a problem. I tell you, my face is all red right now, as getting that kind of information for sites is part of my job and I can't believe I forgot to take that into account with this one. Forgetting that little hangup, where is the typical place to put the equipment pad? Because I had assumed I'd put it along the side of the house, but read on some thread that you can put them next to the pool? Is it just a matter of preference and cost or is there a reason for one or the other? I was thinking next to the house because it would be hidden and, based on the location, stay cooler.